Kalua o ʻAihakōkō, "the put of ʻAihakōkō," is a place name was formerly associated with the shoreline at Kamaʻole I Beach Park. In Ruling Chiefs of Hawaii, Hawaiian historian Samuel Kamakau gives this brief description of the origin of the name: "Kiha a Piʻilani killed ʻAihakōkō lamented grievously at sea. He landed at Kapaʻahi in Kamaʻole, Kula, and that place was given the name Ka lua o ʻAihakōkō (ʻAihakōkō's pit)." Today the entire area is known as Kamaʻole I Beach Park. The beach at Kamaʻole I is a very white sand beach situated between two rocky points. The offshore bottom is sandy but drops quickly to overhead depths. The shorebreak is often good enough for bodysurfing, but generally not big enough to be of concern to those who wish only to swim. Dangerous water conditions occur during heavy surf or kona storms. Facilities in the grassy park include restrooms, showers, picnic tables, barbecue grills, and paved parking. 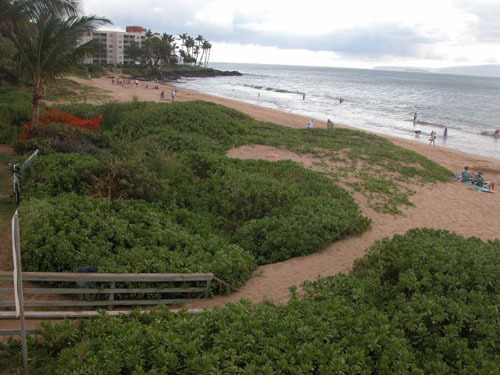 Kamaʻole I Beach Park is located in the 2300-area of South Kihei Road. The north end of the Kamaʻole I beach is known to most local residents as Young's Beach. It was named for the Charley Young family, who has lived on the low sea cliffs above the beach since the 1950s. Charles Clinton Young was born in Minneapolis, Minnesota, on January 30, 1905. When he arrived in Honolulu in 1932, he was a sergeant in the Hawaiian Coast Artillery Brigade. He had been sent to Hawaiʻi as a military reporter covering the widely publicized Massie Case. In the ensuing years Charley and his wife, Betty, elected to remain in Hawaiʻi as civilians and made their home on Maui. In February 1940 they purchased property in Kamaʻole, but before they had a chance to build, World War II erupted. The military took over their land and other surrounding parcels to build a Combat Demolition Training Station. The training was said to have been the most rigid and intense of any naval training at the time. Over forty teams of one hundred men each were thoroughly schooled in reconnaissance and demolition activities. The beaches of Maʻalaea, Kihei, Kamaʻole, and Wailea were fortified to resemble enemy beachheads and they were assaulted in training exercises. At the south end of the beach at Kamaʻole I, an old concrete pillbox is one of the few reminders left of the war years. After the war the barracks and other buildings were torn down, and in 1950 the Youngs built their home. On November 21, 1958, Resolution 83 was passed by the County Board of Supervisors, officially naming a nearby bridge "Charley Young Bridge!" The name is still visible on the concrete bridge located at the south end of nearby Kalama Beach Park. The Youngs had become well-known figures on Maui, especially Charley for his newspaper work with the MauiNews and the Honolulu Star Bulletin, and for his involvement in numerous civic, social, and business organizations. Charley Young died on January 2 1, 1974. A public right-of-way at the end of Kaiau Street leads to Young's Beach, a popular gathering place for local youth from the surrounding neighborhoods. The primary attraction is the bodysurfing waves, which are usually better here than at any of the surrounding beaches.